A few weeks ago, I received an e-mail from the folks at Widgenie asking for a blog review of their newly launched service. Widgenie targets non-technical people looking for an easy way to create and publish charts or data visualizations on the web. As I began looking it over, I wondered whether this problem had been solved elsewhere. It has. I’ve summarized my experiences with five services that can help you go from data table to web chart with ease. Data upload: simple process, options for file types, control after loading data, ease of updating data. 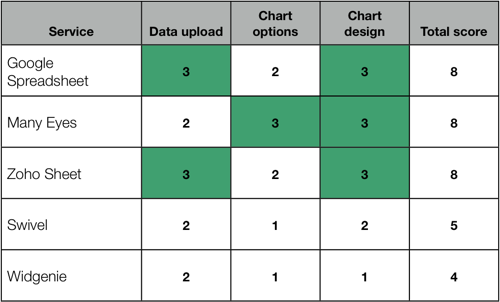 Chart options: different chart types, control of labels, axes, ordering data, and formatting. Chart design: effective data presentation, absence of chart junk. I gave each service a score of 1 (poor) to 3 (great) for each criteria. Top performers are highlighted in green. Unlike some of the other solutions, Google Spreadsheet with charts/gadgets isn’t primarily about creating data visualizations. Nevertheless, in a few simple steps, you can upload data, create a good looking chart, and publish for the web. One key advantage to Google Spreadsheets is that you can easily change and manipulate the data online. The chart output is clean and practical. The chart options are basic, but when you select gadgets rather than charts, you have a lot more visualization options. I was disappointed that it didn’t offer many options for formatting, which is frustrating in an application that is beginning to feel like Excel. 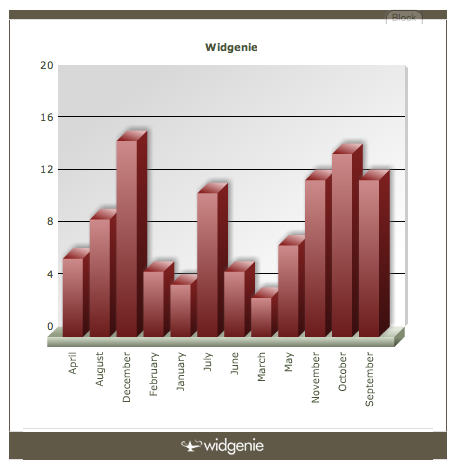 Widgenie is exclusively targeted at the problem of embedding web charts. Overall, I found Widgenie easy to use. The process for loading data and creating “widgets” was straightforward and obvious, if a bit linear (e.g. once you create a widget, you can’t go back to change the chart type). Widgenie offers an above-average number of publishing options, including embedding your charts in iGoogle, Blogger, and Facebook. Relentless use of “animated” 3D charts—where animated means it moves as it is drawn on the screen, not that it shows changes over time in movie format (now that could be powerful). The tag cloud visualization, the lone advanced widget option, colors the text rather than sizing it. That isn’t the way tag clouds typically work. Finally, as you can see from the image below, I wasn’t able to present my data in order of months (though I loaded it that way). When the data is labeled as text, it automatically gets sorted alphabetically. Changing it to date/time made things even worse. Editor’s note: We can’t even embed the widgenie widget in the page because a coding problem with the widget caused all the links on this page to turn red. This problem only occurs with certain browsers. Swivel isn’t directly aimed at the embedding charts market, but still does a competent job of delivering this capability when you select the “post to blog” option. Swivel offers a beautiful data upload process, but failed in its attempted to auto-define the chart type. Like Widgenie, Swivel struggled with ordering my data the way I wanted it, and somehow lost the order of my original data load. The charts are generally clean and easy to read, but they’ve made a strange commitment to vertical grid background which doesn’t work for a column chart. Many Eyes is brought to us by the big-time data visualization thinkers at IBM. They know the right way to present data, and it shows. Unlike the other services, the only way to get data into Many Eyes is by pasting into a text box. When it comes to visualizing the data, however, Many Eyes offers a myriad of options. Using it to create a simple column chart feels like taking a Ferrari to the grocery store. It is worth checking out the word tree, treemap, network diagram, and proper tag cloud. Like Swivel, Many Eyes was designed as an online community for the visualization of public data sets, yet it pulls of web chart publishing with ease. The one negative is the "click to interact" feature on the chart. Fortunately, a Zoho’r explained in the comments how to change from this default view.